This is one of our lunchtime stalwarts. A hearty Puy lentil salad that doesn’t take long to put together once you’ve got the carrots in the oven. 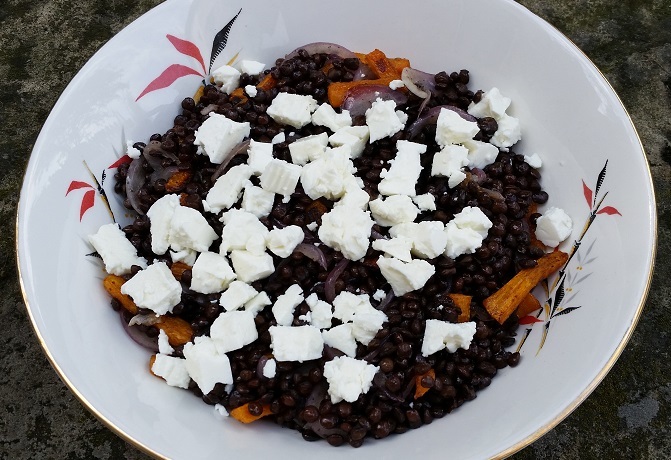 It’s a toothsome combination of flavours: Earthy (the lentils), sweet (the carrots) and salty (the feta cheese). In this recipe I usually use ready-cooked Puy lentils from Merchant Gourmet but you don’t have to. 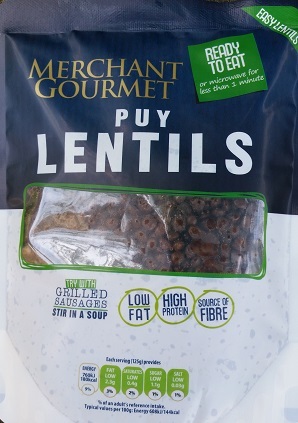 You can replace them with about 100g dried Puy lentils. Rinse them, put them in a saucepan of water and bring to the boil. They usually take about 25 minutes to cook but start checking them from about 20 minutes because you don’t want them to go mushy. The exact amount of feta doesn’t matter. The lentils are filling and a good source of protein so even if you’ve only got a small piece of feta to use up it will still add that salty punch that we’re looking for. Cut the carrot into 1 inch chunks and then cut each piece lengthwise into small sticks. Put the carrot in a small roasting tin and toss with the cumin or curry powder and 1tbsp olive oil. Roast for about 30 minutes, turning halfway through. Cut the onion into fine slices and fry in 1 tbsp olive oil until soft. Add the lentils and cook to heat through. Mix in the roast carrots and lemon juice. Transfer to a serving dish and crumble the feta over the top.